For years, independent film actors Donal Logue (The Tao of Steve) and Kevin Corrigan (Living in Oblivion) toiled away in Hollywood films playing scene-stealing supporting characters while enjoying much more substantial roles in indie fare. By 2001, fans of both of these actors would be in for a treat when they starred in a sitcom together. 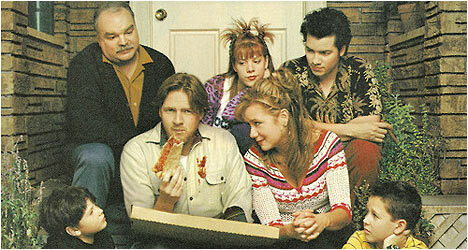 Grounded for Life debuted as a mid-season replacement on the FOX Network where it ran for two seasons before being canceled only to be picked up by the WB Network for three more. Created by Bill Martin and Mike Schiff (3rd Rock from the Sun), the show chronicles the trials and tribulations of a working class Irish Catholic family living in Staten Island, New York. Sean (Logue) and Claudia (Price) Finnerty got pregnant and married at an early age. They’re now in their 30s with three kids: two precocious boys – Jimmy (Frazen) and Henry (Burbage) – and Lily (Bartilson), a mercurial teenage girl. Added to the mix is Eddie (Corrigan), Sean’s ne’er-do-well brother and their strict father (Riehle). At times, Grounded for Life comes across as a slightly hipper version of Roseanne with Logue and Corrigan giving it indie cred. Not surprisingly they are best thing about the show with Logue acting flustered when his kids do something bad and Corrigan playing the slightly creepy uncle always cooking up scams (like hooking up illegal cable in the pilot episode). Logue has a real knack for physical comedy while Corrigan has an offbeat style of delivering his dialogue. Together, they make this traditional sitcom worth watching. However, the show’s secret weapon may very well be Megyn Price who brings an earthy sexiness to her role and has excellent comic timing. She plays well off of Logue and they are quite believable as parents making it up as they go along. Amazingly, they have chemistry right from the first episode. One of the better episodes in the first season features Sean and Claudia going to see the Ramones with their kids even though one of them has to finish a school project and gets in trouble as a result. In a nice twist, it is the parents who are irresponsible, not the kids. The highlight of the episode is when Sean gets into an argument with a nun over the artistic merit of the Ramones. In another episode, Sean tries to keep Eddie from hitting on Claudia’s best friend Nina who just caught her husband cheating. We get a funny flashback depicting a series of disastrous dates Eddie went on with women Sean set up for his brother. Over the course of the episode, Sean, his dad and his kids play a spirited game of Monopoly that is quite funny to watch. Corrigan gets a lot of screen time and interacts with Logue for some hilarious moments. Unfortunately, after the show’s run, Logue and Corrigan returned to appearing in and alternating between indie and studio films. Everything from the previous box set is included with the notable exception of the audio commentaries on various episodes. “Donal Logue: Meet the Finnertys” features the actor talking about his character and how he put a lot of himself in Sean. Logue talks about working with Megyn Price and sings her praises. He also speaks highly of Kevin Corrigan. There are loads of clips from the show mixed in with soundbites from Logue. “Claudia: Not the Sitcom Mom” features the actress speaking fondly about her character and the show. She said that the producers felt she was too young at the time to play Claudia but got the role anyway. Price talks about working with the other cast members. “Lynsey Bartilson: Life with Lily” She claims that the bitchy part of her character was the most fun to play. Naturally, she talks about working with her television parents and what she thought of them. “A Collaboration is Born: Mike Schiff and Bill Martin” The two creators of the show talk about how they met and cut their teeth writing for 3rd Rock from the Sun. They also talk about the various characters and how they cast the show. “Grounded for Life: The Bloopers” is a funny collection of the cast blowing lines and goofing around with Logue adlibbing like crazy. “Grounded for Life: Parents in Training” features highlights of Sean and Claudia’s not so better moments as parents but with hilarious results.